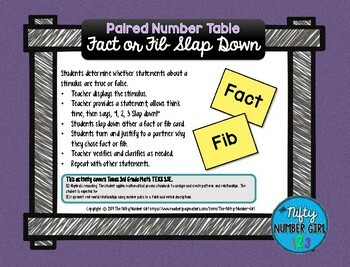 With this Fact or Fib Slap Down activity, students evaluate true or false statements about a paired number table and justify their reasoning. This product is being offered at an introductory price and currently includes 1 paired number table with 6 true/false statements. The product will be updated with more paired number table examples and the price will increase. Snag this product now at a great, low price and you will have access to download the updated files once they are posted. This activity covers Texas 3rd Grade Math TEKS 3.5E.